Yes, there it is again. A day doesn’t go by without another supermarket opening up. They are clogging the area up. 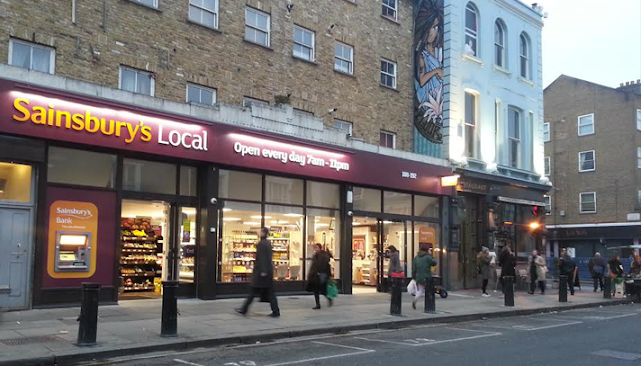 Sainsbury’s has now 3 supermarkets within walking distance from each other. Tesco’s is catching up. Supermarkets are useful and convenient, but when they start popping up everywhere, they become a nuisance. This behaviour by these large companies is nothing short of a disease. It’s as if they suffer from an Attention Seeking Disorder or Narcissistic Personality Disorder, willing to impose their presence everywhere, convinced we need them in every street corner. We don’t. When we first wrote about this we asked readers to answer a survey regarding supermarkets in the area. 57 people responded but not all answered all the questions. Still 94.44 % replied they didn’t want another supermarket. Question 5 of the survey asks: What would you rather see opening up in Portobello Rd - or near where you live and the same is happening? A preserving shop. A breadmaking shop. A brewery. A new age shop. A good charidee shop. A shop where people are taught to flower arrange one week, sew the next, knit socks and crochet blankets. Not another cafe, shoe shop or hairdressers. Not a chain. Independent shops. The big companies are everywhere. a restaurant, Pub .. not another damned antiques shop tho! Shops that used to be in the Portobello: shops that fixed things etc! Something unique. It could be an independent clothing shop, and though I've said no more supermarkets, I would not be opposed to an independent or specialist grocer. A haberdashery shop would be nice. Do those even exist anymore? Importantly, 94.44 % understand residents are not are properly consulted about these changes in their neighbourhoods and 24.56 % believe Social Networks (Facebook; Twitter, etc) could improve the communication between Planning Departments/local Councillors and residents. Finally, on question 10 “ Anything you'd like to add?” there are 5 replies, the first of which questions the seriousness of the survey. Others however point to council rates or councils not being concerned with homogenisation of the high streets. Think some of the options given as possible answers above are not very useful if survey to be taken seriously. It's not like the Council would listen it? ?